This topic contains 11 replies, has 4 voices, and was last updated by bishmanrock 3 years, 1 month ago. I’ve been working on a Risk-style campaign with friends which will follow the original Age of Wonders timeline, and using the official campaign\scenarios. The issue I’m having is that I can’t figure out where the scenarios link up on the map, either using the in-game descriptions or from later games (I’m aware the map changes, but I figured it might provide some sort of guidance). Some I can take a guess at, but others provide no hints and the temperament doesn’t seem the match that of the overworld map. Am I thinking too hard about this? I was striving for accuracy, but I’m starting to wonder if that will be impossible. I remember someone asking a similar question a good while back but can’t seem to find the thread anymore. EDIT: I’m also assuming judging from other texts in-game/in the manual that many of the scenarios take place outside of the map displayed for the campaign, am I right in thinking that? Am I to assume from the lack of responses that it’s impossible to figure out the locations? My intention is to make an overworld map for a YouTube series which will span all the games and show the shifting control of each army as each game is played out. If it’s impossible to figure out the exact locations, are there any sort of educated guesses we can make based on information within the games? At least one or two scenarios don’t seem to mention where they are set at all, whereas others seem to hint about other locations in the world. Hey bishmanrock, I think people don’t check this subforum very often. I honestly don’t know where the scenarios take place. The scenarios also seem to take place in different years so it’s possible some take place in the same area. I’m also not entirely certain that they were designed with the entire world in mind… But I might be wrong. I don’t know enough about the lore to make educated guesses neither, you might want to summon Draxynnic for that. Thanks for responding! I did get the impression most people don’t notice these sub forums! I was running under the assumption that since most of the scenarios in AoW1 deal with the run up to the campaign, then they must happen somewhere nearby, but maybe that was a foolhardy assumption. Many of the scenarios mention specific places, but I’m wondering if these were included mostly just to add to the feel of the world rather than be specific. I wouldn’t blame them, but a Word of God on the situation would be handy. If needs be I’ll just make them up in order to get the series moving, but I’m a stickler for accuracy where possible. How can I get @draxynnic to notice this topic, short of hijacking someone else’s? @ bish, I sent Drax a link. Also, some of the AoW1 scenarios happen after the fall of Inioch, such as After the Fall. Still, good question, as it’s never pointed out exactly where Barondir Bay is, or where the First Conflict took place exactly. Thanks both! I was under the impression that all the scenarios took place between the fall of Inioch and the start of the campaign – but you’re right, at least Blood Isles and First Conflict take place before the fall of Inioch. Yes, maps like Barondir Bay leave me a bit confused. It mentions the Barondir Glacier, suggesting the North judging at the map, but then you have to wonder what the Azrac’s would be doing pushing that far North at that point in time. 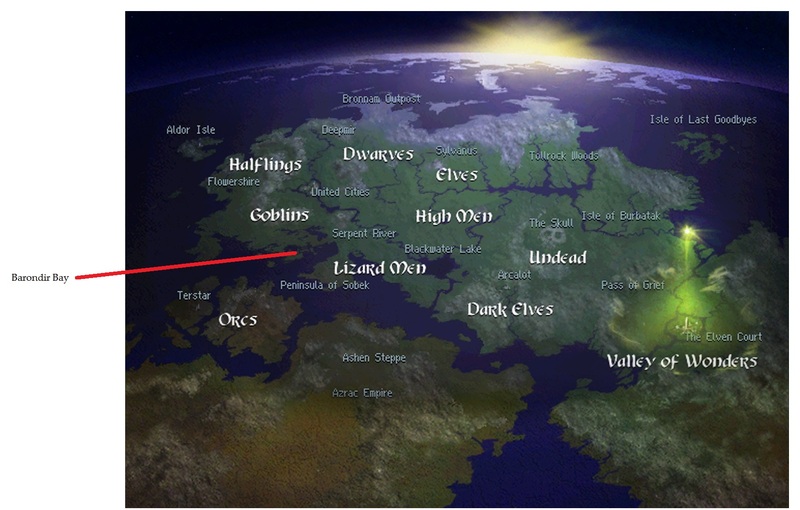 That is of course assuming it takes place on the map shown in the campaign. Well the Azracs did attempt an invasion of the Blessed Continent at one point, but had to scrap it due to excessively hot conditions, that meant they consumed all their supplies. Same heatwave meant the Frostlings retreated, and their emptied lands were taken over by Haflings, setting the scene for future conflict there. It also makes the Keepers somewhat less clean cut than you might imagine. That’s what I remember anyway. If you have shadow magic, install pawels’ map converter, and convert the Aow1 maps into SM, and using the SM editor as a guide (because it is closer to AoW3’s editor than AoW1) you can recreate those maps in Aow3. I’m redoing the entire campaign (slowly – hopefully this Summer, Act 1 will be ready) this way. Is that part of the same arc where the Azracs push for control of the Blessed Continent? 1080 LIR: The Azrac Empire pushes against the influx of new races into its Southern territories. 1090 LIR: Human explorers established a fortress in Barondir Bay. They clash in a bloody contest with the Azracs, Lizardmen and Frostlings who all lay a claim to the land. After a bit of further reading the existence of a signpost pointing out the glacier can’t be trusted to be compared against the overworld map as the description states “carved by glaciers many aeons past”, meaning the area has since changed. Still, the appearance of Frostlings and Lizardmen to me means that this must take place somewhere in the centre, with the Azrac’s pushing North – after which the Azrac’s try to gain more ground, but are pushed back. I think even if I can’t get a Word of God on the matter, I’d still like to chalk up an unofficial map as it’s fun to think about. I have used Pawels’ map converter, although I prefer to do everything from scratch as I’m a bit meticulous like that – like to make sure I’ve not missed anything. I’ve converted quite a few maps, but never any for AoW3. To be honest when I saw that you were doing it I kinda figured repeating the same work to be a bit futile, although if you ever need a hand feel free to shout up. o be honest when I saw that you were doing it I kinda figured repeating the same work to be a bit futile, although if you ever need a hand feel free to shout up. For example, in the United Cities maps, the central, Hafling cities take up much more space in Aow3 than in Aow1, so much so that at least 2 of them have become forts now. However, given that there aren’t that many cities on the map anyway, that central location is still going to be absolutely key to victory. To be honest, though, I haven’t paid that much attention to the single AoW1 scenarios much myself. I can fire up AoW1 (but… not tonight, it’s pretty late local), but if you’ve done the research I don’t think I’ll be able to pull up anything you don’t already have, unless I find an obscure reference in a briefing somewhere. AFAIK, there hasn’t been any discussions from the writers clarifying any of those locations as has happened with some other lore points. That said, from looking up the description, it looks like the glaciers were in Barondir Bay during some ice age in the distant past, not sometime close to the time of AoW1. Given the shape of the land in the map (disclaimer: what I found was an AoW2 conversion of the map) and that azracs, lizards, frostlings and humans all have access to fight over it, I’d probably be inclined to put it in that island region west of the Peninsula of Sobek. That’s just an educated guess, though. Probably a good way to go about it, I was just rotating the maps around and trying to remain as faithful as possible, but that probably holds little worth to most. I have a document listing all the AoW1 scenario briefs and chunks of the timeline that I’ve compiled which holds all the information – although the Barondir Glacier reference I only noticed from a signpost in-game, so I might need to go back and do some further research on things like that, either way I wouldn’t expect you to go trawling through the scenarios. If all the information exists in-game then I’m happy to just slog on, I just wanted to make sure there wasn’t some sort of official lore outside of the game that would contradict it that I’d missed. West of Pennisula of Sobek seems like a reasonable educated guess to me, I’ll probably take that on board. Thanks for the help! I’ll probably disappear for a bit and further compile everything I find and then pop back with some specific questions and hopefully a draft copy of the map for people to debate over. Thanks to everyone in this topic and who contacted me on Steam, appreciate it muchly. Anyway, I’m looking at Blood Isles at the moment. I feel like this is referenced elsewhere, possibly in one of the other games, but can’t find it for the life of me. The AoW manual says “After overwhelming many of these islands, the first Human explorers continue on to the Blessed Continent”, and the scenario description adds “the beaten races served to lead the migrant Humans directly to the Valley of Wonders.” This to me suggests that Blood Isles could be separate from the Blessed Continent, but close enough to still be populated. I did briefly consider that the Blood Isles could be the landmass to the North of the Valley of Wonders, where the river meets the ocean. I’m not so sure about that though. I’m assuming the humans arrived from the East, seen as they managed to settle in the Valley of Wonders within years of arriving. The only thing I know for certain is that they arrived by sea. I’ve attached a map as it stands at the moment, with plans to add more detail as I work through the maps (currently working through chronologically). I’ll continue posting with my research and occasional wild guesses. Feel free to correct me if I’m wrong on anything.